Go Public with the WXXI Public Media App for iPhone! Tap on "Listen" to choose from four different LIVE radio streams to get your favorite WXXI music and news programming. Access "Coming Up" to find out all the WXXI programs, services and events we recommend. The full This American Life archives at your fingertips. This app gives you on-demand access to all episodes going back to the show’s launch in 1995. New episodes are automatically added to the app as they become available. 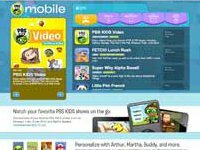 Mobile Apps for PBS Kids! Also visit the WXXI Podcasts page.